I am for RH Law. I am an advocate of freedom of speech. But what Carlos Celdran did was way out of line. 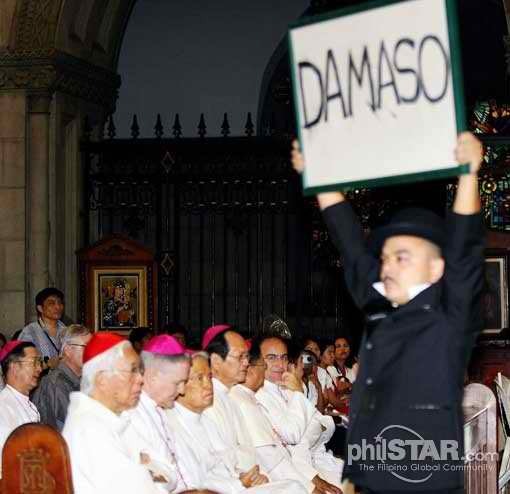 Disturbing an on-going religious service flashing “Damaso” to the mass celebrant is not only offending religious feelings but stepping into others’ right to religious freedom as well. Yes, he is expressing his freedom of speech but he violated others’ rights blatantly. There is a right place and a right time to air his thoughts. It need not be inside a place of worship where people are practicing their beliefs during a mass celebration at that. His incarceration is his fault alone. Not any other person’s but his alone. This was sensationalized because the Catholic Church was involved. But let us see him do that inside a mosque, an INC church, or any other place of worship. The same will happen to him. Yes we have a lot of rights and we must practice it. But we must also bear in mind that with this freedom we also have responsibilities and accountabilities. Our freedom ends where freedom of others begin. That is democracy.